With the aging baby boomer generation, retirement communities have become more popular. There are specific investment opportunities available in this type of neighborhood. However, it may not be the right choice for every investor. A retirement community has a specific makeup. Understanding the profile of a typical retirement community can help you decide if it could be the right fit for you as an investor. A retirement community is an area that has been specifically built for or designated for adults aged 55 or older. Most of the adults in the community are considered retired from their full-time nine to five jobs. They may pursue part-time work but are no longer in the daily rat race. Retirement communities are a development of apartments, condos, or detached homes. Residents typically have the option to rent or to buy a unit depending on their needs. Retirement communities could be part of a gated community that only residents have access to. Retirement communities are active communities for healthy senior citizens. While some retirement communities do focus on medical care, most are based on the idea that the residents are healthy, able-bodied individuals. The community is centered around this active lifestyle. The idea is that it is an all-inclusive neighborhood. While residents are free to come and go as they please, the retirement community offers many amenities which make it unnecessary to venture too far away. Most will have a main dining room where residents can have meals. Some retirement communities offer housekeeping services. There will be a recreation center where residents can interact. There may be a fitness center where residents can take fitness classes. There can also be cultural activities or classes such as painting or theater. Some larger communities will even have their own chapels. Retirement communities are typically located in warmer climates. Florida, Texas, California, and Arizona are all hot spots for retirement communities. Retirement communities are often constructed in proximity to a larger city. This is done so that residents can have access to the culture, entertainment, and medical care that the city offers. The retirement community may provide the residents with transportation, such as a shuttle, to areas surrounding the community, such as the city. In addition, retirement communities are often constructed near public transportation so the residents can have access to a bus or railway system. Retirement communities are specifically designed for retired adults. This usually means that you must be 55 years of age or older to reside in a retirement community. However, some retirement communities do allow residents to be under 55 years old, as long as a certain portion, usually, 80 percent, of all residents are still over 55 years old. Empty nesters are common residents of retirement communities as are single senior citizens. Retirement communities are made up of retirees who are financially stable. They are generally middle income or upper middle income. However, they are no longer working, so will typically have a fixed income of retirement savings that they are able to survive on. 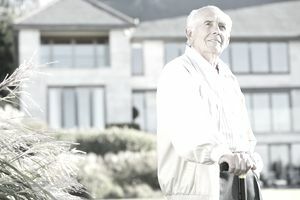 There are certain types of investment properties that are available in a retirement community. Single Family Homes- Every retirement community is different. Some will be made up of single family homes within a gated community. The home may have a small yard but the yard maintenance is usually covered in the monthly homeowner’s fee. Residents may be able to buy these homes or rent these homes depending on their preferences. Condominiums- Another type of investment property available in a retirement community is the condominium. It is not a standalone unit. This is an apartment or suite that is part of a larger complex. They have the same features as a larger home, such as a private kitchen, but are usually smaller in size. They often have an attached balcony or outdoor space if they are located on the first floor. Condominiums are available to purchase or to rent.